ST THOMAS, USVI - Three male individuals, among them a minor, were arrested on Friday August 25, 2017 after being found to be in possession of an unlicensed firearm and accessories thereof, Virgin Islands Police Department (VIPD) Public Information Officer, Glen Dratte announced Saturday. 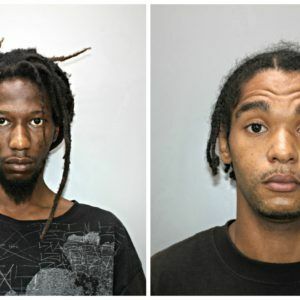 According to Mr. Dratte, at around 12:00 A.M. Friday, patrol officers were dispatched to a vehicle traveling eastward on Alton Adams Drive, with a few male individuals in the vehicle believed to be in possession of a firearm. The patrol officers later came in contact with the vehicle on the Donoe Bypass and stopped it to conduct a search. During the search, officers discovered a holster in plain view in the right, front passenger-side door panel, a magazine clip in the dashboard and a firearm under the driver’s side front seat, according to Mr. Dratte. The three males - 27-year-old Kennedy Pascal, 24-year-old Tyshaun Leedam, and a minor were then taken into custody and charged with possession of an unlicensed firearm and constructive possession of a firearm. They were remanded to Bureau of Corrections Detention Center pending their advisement hearing. Mr. Dratte said the case was under investigation by the Criminal Investigation Bureau. Persons with information regarding this incident are asked to contact the VIPD’s investigation bureau at 340-774-2211 . You may also contact Crime Stoppers USVI with your anonymous tips. Most of the youths are gone. Most not all. This lifestyle they pick up is the new (lit) lifestyle. It's sad it's supported by so many people.